4 Bedroom Mountainside Condo - Enjoy Beautiful Vermont This Winter! 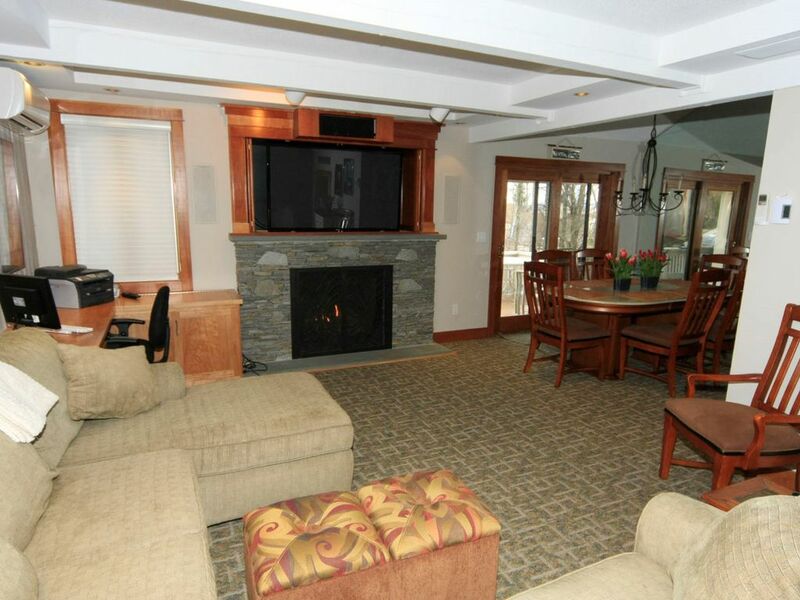 Completely remodeled 4 bed, 3.5 bath, end unit condo on Bromley mountain. Three private bedrooms (two with ensuite baths) with king size beds, plus add'l room with bunk bed. Large LR with gas FP. Located in Bromley Village, only a 5 min walk to the Bromley slopes or take the shuttle to the mountain. Has all the amenities to make your vacation a success. Gourmet kitchen, High Speed Wifi, (2) Family Rooms w/ surround sound. Please note: the condo is not available for full-season winter rentals. Gym (year round), pool (summer), tennis courts (summer), shuttle to Bromley base area. Large living room with comfy sectional sofa. Dining table set for 6, extends to fit 8. We stayed for 4 nights, and everything was wonderful! There were 7 in our party: a family of 5 [Mom/Dad + 2/4/6 year olds], plus grandma and grandpa. The house had more than enough room for everybody, and it had everything we could have wanted: a well-equipped kitchen, TV's (with nice surround sound! ), etc. Location was great: easy walk to/from the mountain for the adults, but convenient front-door shuttle service for when the kids were coming out to ski. A short walk down the road, there was also a great sledding hill with a huge fire pit at the bottom, and a pirate ship playground, which made for a fun outing with the kids. Thanks for sharing your family ski condo! Home away from home. So cozy and new! Home is done so well! Beds comfortable, kitchen great, couch big enough for all! Says sleeps 8 but sleeps 10. We were only 7. We have rented on mountain before but this was the best! Will be back! This trip was a first ski trip for our young children -- 3 & 6 -- and Bromley fit the bill. Small, lots of ski school options and an easy trip from NYC. To arrive and find our rental house was so well-appointed, was Perfect! Each of the rooms was comfortable for our group of 4 adults and 3 children -- with rooms divided over three floors, there was enough division to give everyone some space. The bathrooms have all top of the line fixtures with comfy towels. The real center of excellence is the fully-stocked kitchen, with pizza stones, sake sets, fondue pot, and martini glasses in case you need a themed party, each night. As a family that appreciates cooking together each night, this was SO appreciated by everyone. We watched the Olympics, while the fire burned and eating a gourmet meal! Each morning, we took the convenient shuttle down to Bromley, which made the location all the more dreamy. Thank you for sharing your perfect, comfortable condo with us! We had a wonderful stay the condo had everything we needed and more. We were as happy to relax there as we were to hit Bromley Mountain to go skiing. Owners were lovely and very helpful! Look forward to staying there again. GREAT condo! Plenty of room and super nice! Check-in time is anytime after 3pm. Check-out time is 11 am.